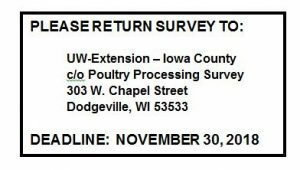 The Driftless Poultry Processing Cooperative (DPPC) was recently formed for the purpose of studying the demand for a USDA poultry processing plant located in southwestern Wisconsin. Federal inspection would allow your product to be legally sold across state lines to restaurants and outlets in Chicago, Minneapolis, Dubuque, Rockford, etc. DPPC is looking for your input to determine the interest, services and potential volume of product that could move through a federally inspected plant and whether these numbers justify the investment. We have created a survey (electronic and paper – see links below) to assist us with gathering this input. Your honest, and in-depth responses will be extremely helpful in helping us understand the potential for such a processing plant. Como empleador que brinda igualdad de oportunidades en el empleo y acción afirmativa (EEO/AA, por sus siglas en inglés), la University of Wisconsin-Extension, proporciona igualdad de oportunidades en el empleo y en sus programas, incluyendo los requisitos del Título VI, Título IX, y de la ley federal para personas con discapacidades en los Estados Unidos (ADA, por sus siglas en inglés).